Back in May, The New York Times published a dining article and video about cooking steaks at home, and it kind of rocked my world. It basically turned everything I knew about cooking steaks upside down. Most of the old rules, like using very high quality meat, searing at the highest temperature possible and picking bone-in cuts, still apply when you’re talking about steakhouse cooking. But for a casual meal at home, the article is right: there’s a totally different technique. Even though I blindly trust the New York Times, I still tested their technique, and the results were insane. I got a really good, dark crust on the outside of these manager’s special ribeyes, and they were perfectly medium-rare throughout with no gray ring around the outside. I will caution you (unlike the article) that this cast-iron cooking will smoke up your kitchen like crazy. I think my cooking two steaks generated enough smoke to fill a 6,000 square foot house. I look forward to a future where I own that house. And a grill that gets up to a thousand degrees. And my personal butcher dry ages my 72 oz. porterhouses for 45 days. But until that time comes, you can’t beat this method for making your own steak. I can see myself doing this a lot for simple weeknight suppers with a salad. Or, you know, a gallon of creamy blue cheese onion sauce. Oh yeah! This sauce. It was awesome. I don’t feel bad for slathering my $7 steak in it one bit. I totally stole this from the Pioneer Woman. Sorry, Ree – I hope we’re still cool. See you at the next food blogger illuminati meeting. Before cooking your steak, pull it out of the fridge and let it come to room temperature sitting on top of some paper towels. 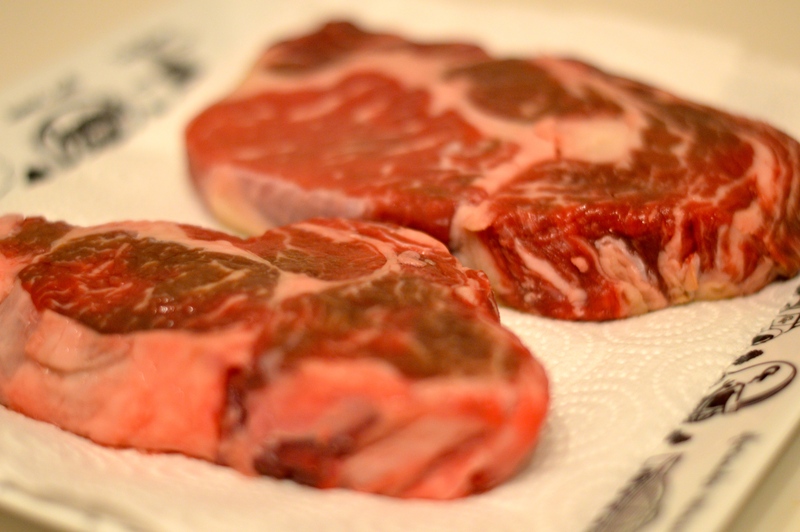 Be sure that the surface of the steak is dry before cooking. 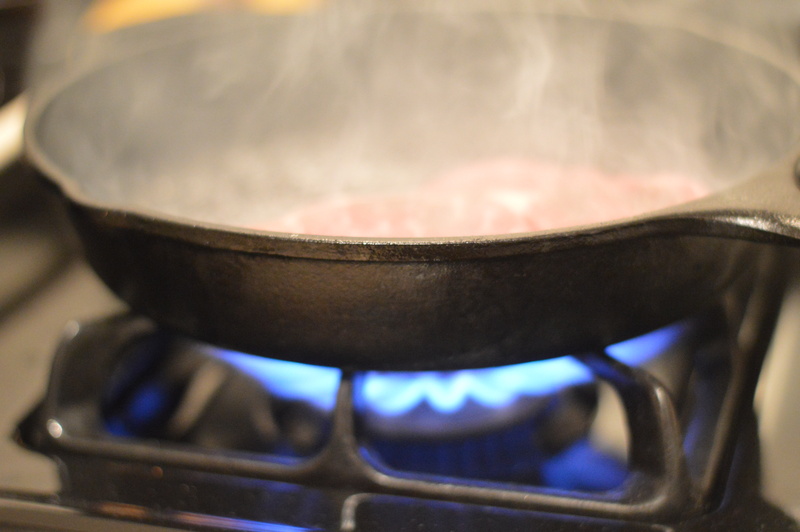 Place a well-seasoned cast iron skillet over extremely high heat, as hot as your stove will go, for about 10 minutes until it’s pretty heavily smoking. Sprinkle the pan with salt. Place the steak in the pan and sear it for about a minute, then flip it. Move the steak around the pan to pick up the extra salt and continue to flip it every 30 seconds or so. This whole process should take about 5 minutes for a medium-rare steak. Sprinkle each side of the steak with pepper on the last two flips. Let the steak rest for at least another 5 minutes when you remove it from the pan. Put a large frying pan over medium high heat and add the olive oil. Fry the onions in the oil with a pinch of salt, until they are softened and turning golden, about 10 minutes. Add the cream to the pan and once it begins to boil, turn the heat to low. It should be bubbling around the edges and thicken up after about 10 minutes. 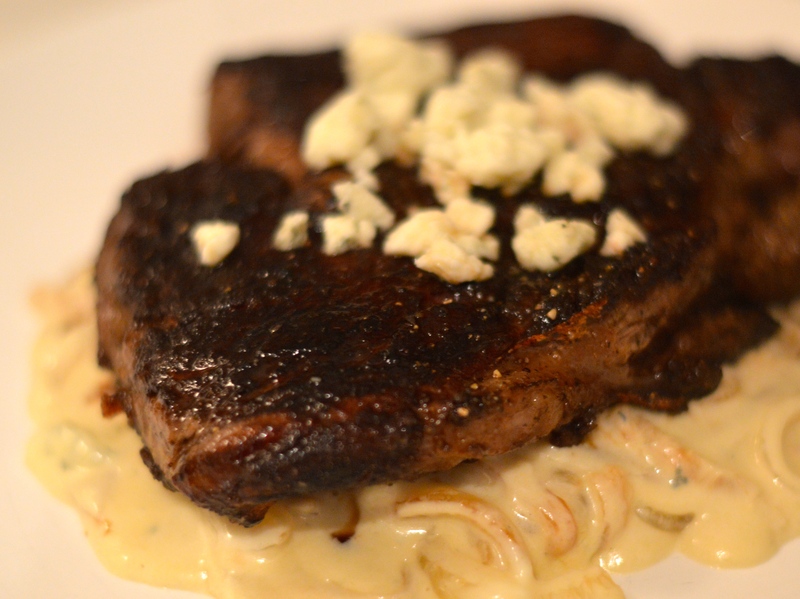 5 minutes before you are ready to serve, add the blue cheese and melt it into the sauce. This should make it much thicker. There should be ample sauce for two steaks or more.